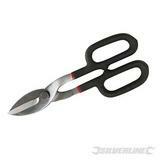 Traditional scissor design with heavy duty hardened and tempered blades. For cutting thin gauge ferrous and non-ferrous sheet metal. Double-dipped soft-grip handles. Cutting capacity: aluminium sheet 1.8mm, mild steel sheet 1.2mm and stainless steel sheet 0.8mm.